INDIGO! is a Corporate Travel Management platform for managing the Company’s traveling activities. The platform not only offers airlines and hotel reservation, but more importantly to help the Company to implement appropriate business trip procedures and help the Company to manage efficient business trip expenditures. INDIGO! 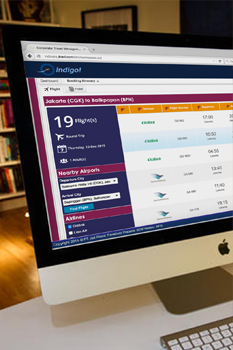 is your ultimate resource for hassle-free corporate and business travel planning. Customized services ensure satisfied travelers. Here are some of INDIGO! Rich content: 89,000++ hotels around the world, 9 major airlines, covering most destinations in Indonesia. Connected to banking system as payment solution provider. Easy to manage pre-booking processes (submit request, workflow approval, budget checking, policy checking, etc.). Easy to manage post-booking processes (reporting, reconciliation, corporate travel behavior analysis, etc. ).